The last flowers of summer, strong and tall. A playground in itself for butterflies and bees. A wonder of discovery for children. Nature is the greatest teacher. Every day the playground at school is chocked full of something to be discovered. It waits, quietly and patiently, hoping children will find all its hidden gems. Will they find Chippy’s new tunnel? Will they stand under the maple tree to look up and see the changing colors? Will they find the last of the yellow tomatoes hidden on the vine? Will they follow the butterfly as it plays in the flowers? The treasure chest awaits. 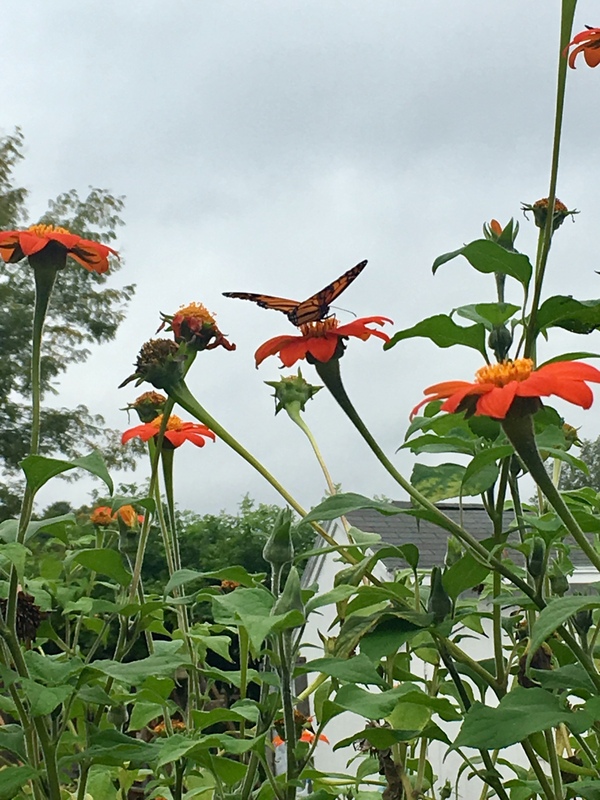 This entry was posted in Early Education, Imagination, joy, Mother Nature, Nature, preschool, Teaching young children, wonder and tagged butterflies, Discovering nature, flowers, Nature, Teaching children, wonder, young children. Bookmark the permalink. Ours were fascinated by the garden spiders and webs this week!!! Oooh, that Monarch Butterfly is gorgeous on that lovely flower. Nature is a wonderful teacher. Nature is the best. How great that you take advantage of it. Thank you, Darlene. We are lucky to have a big playground with lots of nature to explore. I was teaching English as a Second Language to 6 young Tibetan girls on a beautiful Spring day in Vancouver. The classroom was in a basement and I thought we shouldn’t waste a day like this. So I took them to one of the many parks in the city and we discussed the English names for the trees, flowers, birds etc. They loved it and most likely learned much more than in a stuffy classroom! You just knew the right thing to do. What a perfect learning experience for those girls. In preschool we don’t have a formal ESL program. Young children learn so quickly, and we incorporate their words from home. I often feel we learn as much from the children as they do from us! Treasure chest = nature’s playground. Great phrase, Jennie. Speaks volumes on how much there is to explore each and every, everyday day. Are those your butterfly/flower photos? Gorgeous. Lovely. It sounds like you’re a great teacher for this. Nature is so beautiful and you can’t beat monarch butterflies they are truly kings and queens. Beautiful photos – nature really is amazing! Thank you, Eliza. Indeed, nature is amazing! For us it’s the forest path below our school yard- it’s the best teaching tool ever! A forest path- how wonderful! I can imagine how that would be full of teaching opportunities. I went to school in the inner city, with little or no ‘Nature’ to explore. So it’s great to hear about your kids discovering the world around them, Jennie. I often think about children in the city and their lack of nature on a playground. Planting and gardening can bring nature in, and that’s a big plus. Glad you enjoyed a peek at my playground 🙂. Best to you, Pete. Simple lessons to be enjoyed! Those last few plants that bravely bloom in late fall are so precious. Sometimes if people (especially kids) don’t notice them, it doesn’t hurt to point them out, as you’re doing. Next time they’ll see them on their own. It’s all subtle guidance that helps shape and enrich their lives in many small ways. Nature is indeed a treasure chest and the greatest teacher. 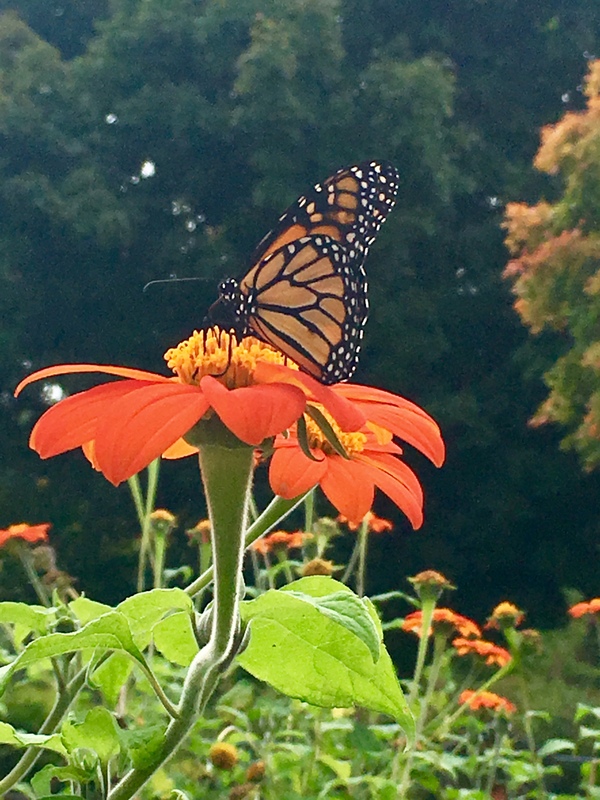 Love your photos of the monarchs – such beautiful butterflies! Wish we’d had them here in Europe too! A fantastical journey is childhood; especially with amazing teachers like you. Have fun this year, Jennie — I know your class will! Wonderful, Jennie. And it’s not just kids who notice those miracles. Every season that brings all the. Ganges truly is a miracle to notice and be marveled. I remember going to visit Kirstenbosch botanical gardens in Cape Town when I was a girl of 9, Jennie. It was such an amazing experience for me; I just loved the flowers and plants. I still do. Lovely post. Those beautiful nature experiences stay with you. I wish every child could see such beauty. You were lucky. Many thanks, Robbie. As a child, one of my favorite things to do was to lie in the grass in my backyard, and watch the insects, worms, etc. crawling through it. It was fun to imagine what it must be like to be an insect or a worm and how they must see life. Loved this post. Thank you, Anne. I wish all children could have that experience. Thank you kindly, Jennie. Me too! Childlife is such a magical time, and all children should be able to look at our world from all kinds of angles to stimulate their imagination. I saw a wonderful video of a dad holding up his little boy in a Spiderman’s costume so that the little boy could experience crawling up the walls around the doors like Spiderman. The little boy was having the time of his life and I thought how wonderful for a child to get to experience this! Yes, it it. Thank you. Wonderful perspective….what an inspiration you must be to your students.